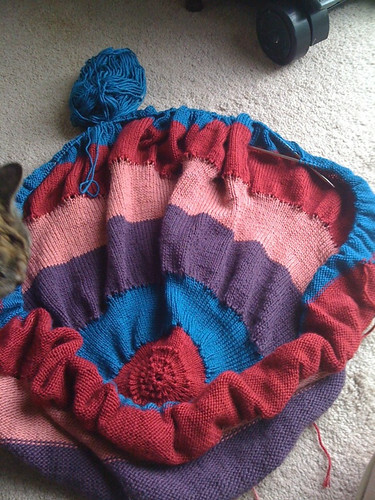 This is the blanket/shawl thing I was hoping to finish for the Knitting Olympics. As you can see, several weeks later I'm still nowhere near finishing. However, I do need to start thinking ahead to the next section. As you can see, I already have quite a bit of the stitches all bunched up to make enough room to work. However, once I finish the remaining 15 rounds, I have another increase section and then 50 rows of lace. Is the set of needles I'm working on long enough? The only solution I can think of is to get an Addi Click system, which allows me to combine 2 cords to make one super-long-mega cord. Tripsie says it's plenty big enough and I should just give it to her now. 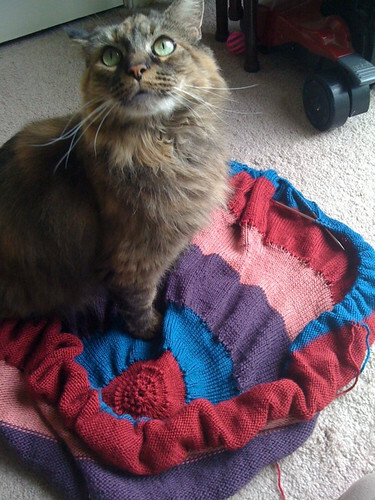 Don't get discouraged... the larger these blankets get the harder it is to resist temptation to bind off! !